Something delicious is brewing in your kitchen. This creamy latte has a touch of spice and a hint of tropical flavor to make it a delicious escape for your taste buds. This recipe was created by Judy Fitzgerald, a Capresso Event Representative. Thanks for making this tasty drink, Judy! Using your teaC100, bring water to a boil. Place 1 key lime ginger tea bag in each cup and pour 4 oz. of boiling water into each cup. While tea is steeping, place the frothing disk into the froth enhancer of your Capresso froth TEC. Add milk and cinnamon syrup to the frothing pitcher. Place lid and press the Hot button. Wait for the frother to shut off automatically. 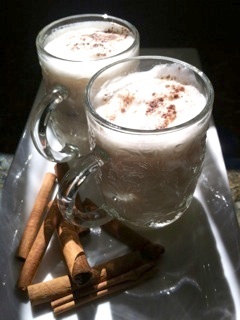 Remove the tea bags from cups and pour the hot frothed milk over the Key Lime Ginger tea. Garnish with ground cinnamon if desired. Enjoy! How do you plan to celebrate this Earth Day? Maybe you’ll plant a tree, ride your bike instead of driving, or donate to a Green cause. Reducing your carbon footprint is easier than you may think, and even the smallest changes can make a difference in the wellbeing of our environment. One small change can start in you kitchen. Did you know that Capresso electric water kettles can boil water in about half the time as stove-top kettles, saving not only time but also energy? Capresso electric water kettles offer eco-conscious safety features such as boil dry protection, which shuts the unit off when no water is detected, plus automatic safety shut-off when water has reached the desired temperature, and shut-off when kettle is removed from base. Go Green this Earth Day, and all year long, with Capresso’s line of Electric Water Kettles, including the teaC100, H2O Pro and H2O PLUS.